Albert Einstein once said: `The most incomprehensible thing about the universe is that it is comprehensible.' Simon Singh believes geniuses like Einstein are not the only people able to grasp the physics that govern the universe. We all can. As well as explaining what the Big Bang theory actually is and why cosmologists believe it is an accurate description of the origins of the universe, this book is also the fascinating story of the scientists who fought against the established idea of an eternal and unchanging universe. Simon Singh, renowned for making difficult ideas much less daunting than they first seem, is the perfect guide for this journey. Everybody has heard of the Big Bang Theory. But how many of us can actually claim to understand it? 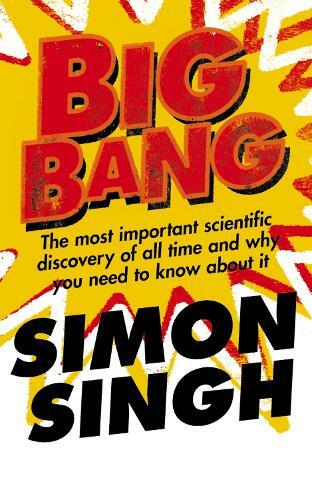 With characteristic clarity and a narrative peppered with anecdotes and personal histories of those who have struggled to understand creation, Simon Singh has written the story of the most important theory ever. Awesome. Way better than A brief history of time.